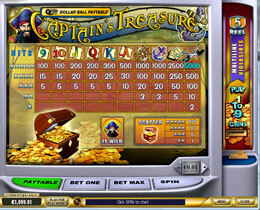 Captain's Treasure - 5 Reel, 9 Payline, Video Slot. This slot is part of the Dollar Ball Jackpot exclusive to Playtech. 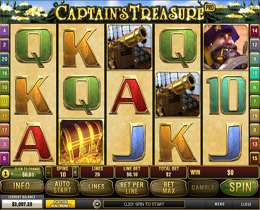 The theme of this game is all about brave Pirates and an adventurous Treasure Hunt. Captain, Treasure Chest, Swords, Ancient, Treasure Map, Sea Anchor and Wheel. There are also the 9 playing card symbols from 9 to Ace. Play for Free or Real Money. 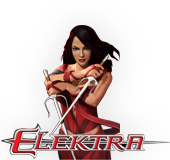 The minimum bet begins at 0.01 going up to the maximum bet of 100.00 per spin. The Wild Symbol will only appear on the 2nd, 3rd or 4th Reel. The Captain Wild symbol substitutes for all other symbols including the Scatter symbol which is very unusual. The Captain also doubles the payout of any winning combination it completes when acting as a substitute symbol, but not cumulatively. The Scatter can appear scattered anywhere on the reels. The scatters must be consecutive but don't have to follow any payline. When the Scatter appears 2x or more the winning combination will be complete. This is a Lotto style side game, there is obligation to play this game. Pick 5 numbers out of 49, when the main game begins 5 numbers will be drawn randomly. The more numbers matching your pick will mean more winnings for you! When all 5 numbers match, the Dollar Ball Progressive Jackpot will be won. The graphics and sound effects are excellent, making this a very exciting, fun and popular game. This game is suitable for players who enjoy authentic animations, and a bit of adventure!